What a mess. 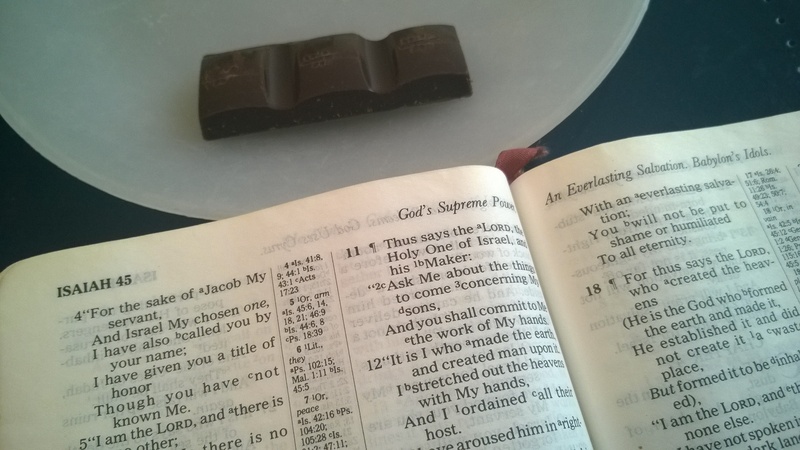 I’ve got maybe half an hour before I leave for my evening job, I haven’t had lunch yet, I just got back from a Kroger run to pick up today’s chocolate, I read Isaiah 45 and photographed it, and then I realized: I have unfinished business in Isaiah 44. Forget everything you just read, Jackson, because today you gotta backtrack and talk about idolatry in Isaiah 44. Here we go, let’s reread this stuff and say stuff about it. Isaiah focuses on idolatry in 44:9-20. His thesis is that idolatry is useless and dumb: “Those who fashion a graven image are all of them futile, and their precious things are of no profit” (9). He describes the processes by which craftsmen create idols, chopping down trees and heating iron, shaping their materials. The woodcarver will use the same wood he chopped down as firewood; he’s the master over his materials, and they serve him. But Isaiah observes, “[T]he rest of it he makes into a god, his graven image. He falls down before it and worships; he also prays to it and says, ‘Deliver me, for you are my god'” (17). As if he’s forgotten where the idol came from, the craftsman turns around and gives himself to the same stuff he burned up cooking his bread! He’s a slave to impotent, inanimate matter. In 21st-century Christian America, our gut instinct when we encounter passages about idolatry is to apply them metaphorically: activities like working long hours at our jobs or watching TV can be idols, or relationships can be idols, or generally immaterial things that we give ourselves to instead of God. And that’s fair, but I think it’s important to remember the material nature of the idols in passages like Isaiah 44, and the culture they’re addressing. The Hebrew word for “idol” used here is pacal (pronounced “puh-SAL”), and it refers specifically to a carved thing, something hewn into shape. You can’t literally take a chisel or an adze to a block of workaholism and shape it into a Job Idol, because these things are intangible. That’s technically a problem of misplaced worship, not strictly speaking of classical idolatry. Given the emphasis on God as creator in these chapters, I think a key point is that our worship should be directed upwards, not downwards. God created man, and man creates crafted works. God is at the top of the hierarchy, and as such he’s the only one worthy of worship. Material objects, no matter how we shape them, don’t even have a soul. Really, they don’t even do things. When we give ourselves over to them, when we think they can bless us or save us, we’re wasting ourselves. BJ from The River Walk recently had an excellent post on idolatry, which I recommend reading. It’s good stuff. Okay, gotta split, it’s job time. See you guys tomorrow. Posted in Daily Reading, Isaiah, Old Testament.Tagged bible, christianity, Hebrew, idolatry, Isaiah, scripture, word study, worship.